Reading the title of this post one is likely to assume that it’s about a plane accident. Not so. The aviator, a guy by the name of Nate Saint, was a missionary who was killed in 1956 by people from the Huaorani tribe in Ecuador, the same tribe that he wanted to convert to Christianity prior to his death. Nate’s son Steve continued his father’s missionary work, helped Indians in Ecuador, and is a pilot (now 60 years old and lives in FL). My flight today with my CFI John is related to the work of the late Nate Saint, although we flew in MA, and did not do any missionary work. The connection between my flight today and the late Nate Saint? Nate air-delivered gifts to the Huaorani tribe, whose village did not have a landing strip. He would fly his plane over the village and lower a bucket connected to a line. The bucket was full of gifts for the Huaorani. After a few flights, the Huaorani wanted to reciprocate by putting gifts in the same basket so that Nate could pull the basket and fly home with their gifts. Doing this basket-based exchange is easy if you’re flying a helicopter, but how do you do it from a fixed-wing airplane? Answer: you gently lower the basket, then fly circles around it so that the basket is stationary at the center (and you make sure there’s enough slack in the line so that the turn does not have to be a perfect circle). The indigenous people approach the stationary basket, exchange gifts, wave to you, then you gently increase the radius, climb and pull the line. The same trick was also used by other pilots for two-way mail delivery. Flying around a point, a maneuver called Pylon Turn, is tricky because of the wind. Today we had 30 knots wind, so correcting the bank angle to maintain a constant turn radius is not practical. Instead of maintaining a constant distance to the pylon (the object chosen to be the center), The idea is to lower the left wind (if you’re turning CCW, otherwise it’s the right wing), and have the point you’re circling fixed on the low wing’s tip. Because of the changing wind angle, the point will move backward and forward on the wing tip, and to correct it you must climb or descend slightly. The wind would in fact elongate the circle into an eclipse, but you will circle the pylon and always have it at the same angle. We flew 5 circles for 8:44 minutes, then John introduced the next maneuver: Eights on Pylons. In this maneuver, you choose two pylons. You fly CCW around one pylon, then CW around another, and then repeat this, so you keep drawing the figure 8. This is much more challenging, of course. We spent 20:14 minutes on this. We ended the lesson with four chandelles. Turns out that I totally screwed up the chandelles I did on my own last week, partly because I did not apply full power in the turn. Now I have a better chandelle to be used as a standard until replaced with a better one. 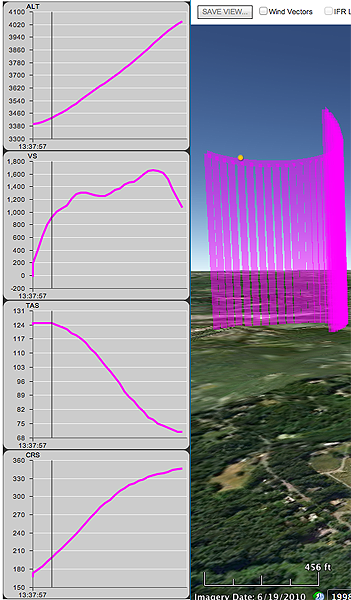 This one, which today is colored pink, started at 126 kts and ended at 70, was relatively smooth climb of 650’, and was close to 180°. A Candlelit Dinner What if your engine quits over New Hampshire?